It is often difficult for beginners to learn to use the correct footwork. 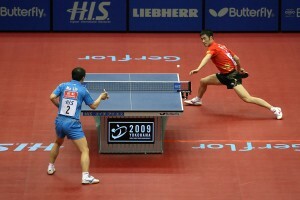 At the beginning, you can get away with poor footwork since it is not the most important part of the game. But as you get better having good footwork becomes more and more important, until it is an essential component of the game in advanced play. Rather than starting out the wrong way and picking up bad habits that are hard to get rid of later, I’ll give you some simple tips that will put you on the right track for the future. The point of using footwork is to get you to the ball so that you can hit the same stroke as much as possible. Good footwork allows you to consistently use your best technique, instead of having to stretch, be cramped, or bend from the waist. Good footwork is not just about sheer speed. It’s also about moving the right amount at the right time. A slow player who moves correctly will have better footwork than a quick player who goes to the wrong place, or with his feet the wrong way around. One of the most common errors I see from beginners is what I call the ‘all or nothing’ syndrome. This is the habit beginners have of not moving their feet at all if they can stretch for the ball, even though this puts them off balance. Then, for balls that they can’t reach by stretching, they move too far, and actually get too close to the ball, cramping their stroke. You can avoid this problem by remembering to always move to the ball, even if you only move six inches or so. Get in the habit of moving into position, and you will soon be able to get into the right position to hit the ball, whether it is near or far away. When your opponent hits the ball very hard, you may find that you do not have time to move your feet at all. When this happens, leaning a little to the left or right to reach the ball may be necessary and unavoidable. But move whenever you can, you’ll be better balanced to hit the ball, and you’ll be able to recover for the next stroke more quickly. Do you have something to share based on your experience? We will like to hear that. Feel free to comment!